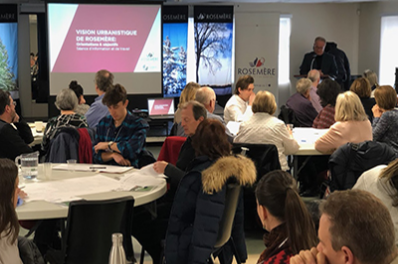 Rosemère,March 21, 2019 – On March 16 and 20, more than 100 residents took part in public consultations on the urban development of the Town of Rosemère, sharing their vision and their ideas in a spirit of mutual trust. Several younger citizens were also on hand to describe how they see the Town’s future. a) Conserve and enhance natural areas in order to maintain Rosemère’s small town charm and overall liveability. b) Sustainably manage land use to better protect against climate change risks. a) Fulfill the needs of current and future residents by developing high-quality living environments that are seamlessly aligned with their designated purpose. b) Prioritize the redevelopment of existing areas over the development of new living environments in order to consolidate land use. Preserve and promote the identity and heritage of Rosemère. Improve sustainable mobility by focusing on active transportation and public transit. Promote a stable, sustainable and diversified economy. The ensuing conversations touched on a number of issues, challenges and objectives related to these points. A vision for the future of Rosemère as a proud, green and prosperous town was adopted in 2018. Various projects will be built around this framework in the coming years as the Town’s urban vision is translated into reality. A team will analyze the comments and suggestions from the consultations over the next few weeks in order to identify concrete solutions, specific actions and projects to be implemented in line with Rosemère’s vision. A subsequent public consultation will take place in September2019 concerning development concepts for the Town. The process will culminate in a revised community plan, which will be presented to the public in the winter. Stay tuned!